Since last August, I've been developing and presenting storytimes at Barbara's Bookstore's BOOK MARKET at The Glen Town Center in Glenview, IL on the first Thursday of every month! The manager liked my "Mama, LOOK!" storytime, ML activity, and signing soooo much that he suggested to The Glen Town Center hire me to take over the story time duties of the infamous storytime lady who had recently left. My storytimes are literacy-rcich celebrations filled with interactive readings, fingerplays and songs, and hands-on, environmental art, science, and nature activities. October: Theme: A Not So Scary Halloween: Books: Not So Scary Halloween Books, Activity: Pumpkins to color, and not-so-scary Halloween pop-up books to make! November: Theme: CHOOSE KIND: Books: Books about kindness, Activity: Choose Kind Mural! December: Theme: SNOW! Books: New and Classic Snowy Books, Activity: Snowy scenes featuring Peter from Snowy Day and Small Walt! ! January: Theme: New! Books: Books on new friends, new shoes, and new pets! Activity: Decorating a calendar for the New Year! February : THEME: VALENTINES DAY! Books: Valentine Bears, LOVE.. Activity: Creating Valentines for people who might not normally get them! March: THEME: "You've Gotta Love Caldecotts!) Books: All of the Caldecott 2018 Gold Medal and Honors. Activity: Caldecott-inspired puppets, book-making, and more! April: THEME: RAIN, Books: SINGING INT HE RAIN, RAIN, THE ORANGE UMBRELLA, etc. Activity: Water Color Painting with paints (water for babies! ), paper boats for puddles, and paper airplanes for when the rain clears! May: THEME: Happy Mother's Day! Honoring our dear mamas! Books: "Mama, Look!" "Mama, Do You Love Me?" "Things Mommies Love!" "The Runaway Bunny!" ...and a few more:) Activity: Decorating Mother's Day Flower Pots, and large Mother Day Cards! June: THEME: Summer Fun! Books: "There Might Be Lobsters", "Mama, LOOK! ", "JABARI JUMPS!" "NOW!" "AND THEN COMES SUMMER!" and "SHARING THE SEASONS!" Activity: Sunny mosaics and summertime mural. AUG: Theme: Numbers! Books: "Bunnies Count," "No More Monkeys Jumping on the Bed," "Five Little Ducks" and more! Activity: Lots of counting, and making our own counting illustration books! JULY: Theme; Celebrating independence! Books: "Jesse Bear What Will You Wear!" "Jabari Jumps!" , "No, David!" Activity: Creating our own I CAN DO ANYTHING books! SEPTEMBER: Theme: Shapes and Colors! Books: "The Perfect Square", "The Love Triangle," "The Square," "Press Here," Craft: Space Collages! OCTOBER: Theme: Not too Scary Halloween, Stories: Halloween Classics and New Favorites, Craft; Not too Scary Halloween Door Decorations (bats, pumpkins, and monsters with paper plates and shapes! NOVEMBER: Theme: Give Thanks! Books: Thanksgiving Classics and New Favorites: Craft: Thanksgiving Placemat or wall hanging! DECEMBER: Theme: Ho, Ho, Holidays! 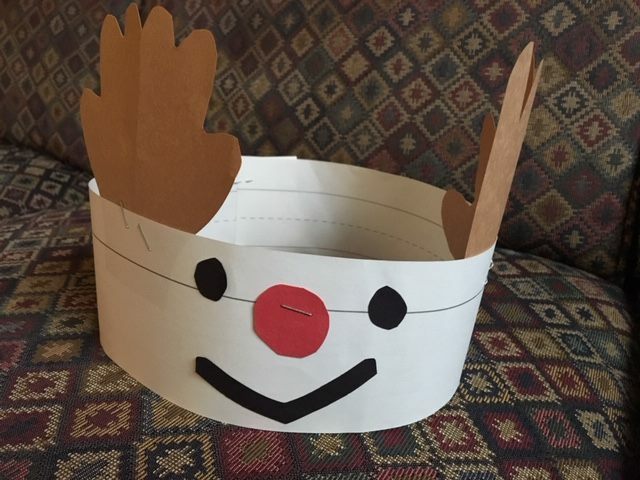 Books: Holiday Classics and New Favorites, Craft: Rudolph the Reindeer Hats!